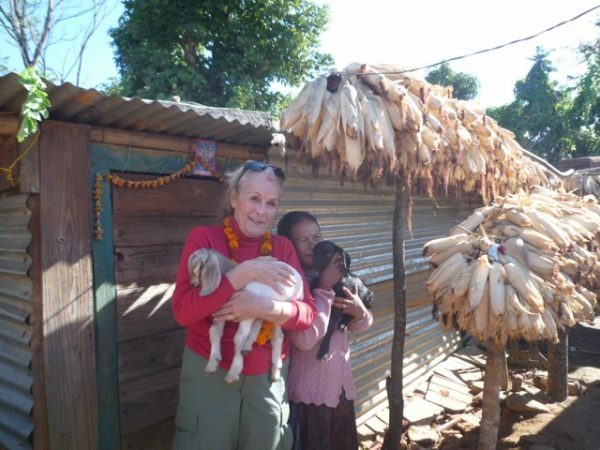 Rosalind Russel with a days-old kid in Nepal, where since the 2015 earthquake, villagers have replaced brick homes with tin houses that provide little protection against weather and predators. The San Juan Christian Science Church donated just under $1,500 to the R-Star Foundation, a local non-profit that serves and educates the isolated and disempowered women and children of Nepal, founder Rosalind Russell said in a statement. The moneywill be applied to projects such as greenhouses that enable year-round production of cash crops to help the poorest rebuild their homes destroyed in the 2015 earthquake. Currently R-Star has 44 greenhouses in place in as many villages.